Cultivate Health from Within is the definitive guide to antibiotics, probiotics, and natural human microecology. 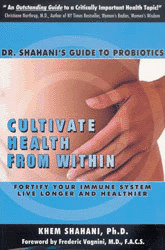 Dr. Shahani, who has explored the topic during four decades of scientific research, explains how probiotics prevent the onset and progression of disease, enhance the immune system, and reduce the likelihood of menopausal symptoms and osteoporosis. He then provides treatments for such common problems as anxiety, high cholesterol, rheumatoid arthritis, food allergies, skin conditions, and yeast infections. In a straightforward manner, this eye-opening book also discusses the current overuse of antibiotics in America. A comprehensive Resource list guides you to recommended probiotic supplements, as well as to good food sources of probiotics. With Cultivate Health from Within, you will be able to better overcome current health problems and ensure a healthier future for you and your family. to the World Health Organization (WHO), and has received many awards for scientific achievement. He has also published more than 200 peer-reviewed scientific articles.